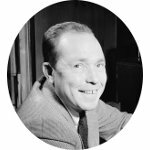 Johnny Mercer was a music industry businessman who co-founded Capitol Records with Buddy DeSylva and Glenn Wallichs. He was also a songwriter and composer who composed the music and/or lyrics for Broadway shows as well as feature films. He was nominated eighteen times for an Academy Award for Best Original Song and won four times. Johnny Mercer is a 3rd great-grandson of Revolutionary War hero General Hugh Mercer. Other famous military generals in his family tree include Confederate General Robert E. Lee, World War II General George S. Patton, signer of the Declaration of Independence General William Whipple, Confederate General James Longstreet, World War II General Douglas MacArthur, and World War II general and author of “The Marshall Plan” General George C. Marshall. His presidential kin include George Washington, Thomas Jefferson, James Madison, John Quincy Adams, William Henry Harrison, Zachary Taylor, Theodore Roosevelt, Franklin D. Roosevelt, and both Presidents Bush. Johnny Mercer’s royal ancestry includes a direct descent from King Edward I and a couple of Magna Charta Sureties, Hugh le Bigod and Sir Saher de Quincy. He also has family connections to the current royal family including the late Princess Diana, Camilla Parker Bowles, and Catherine Middleton.